A company enjoying a good reign must possess an assortment of umbrellas. 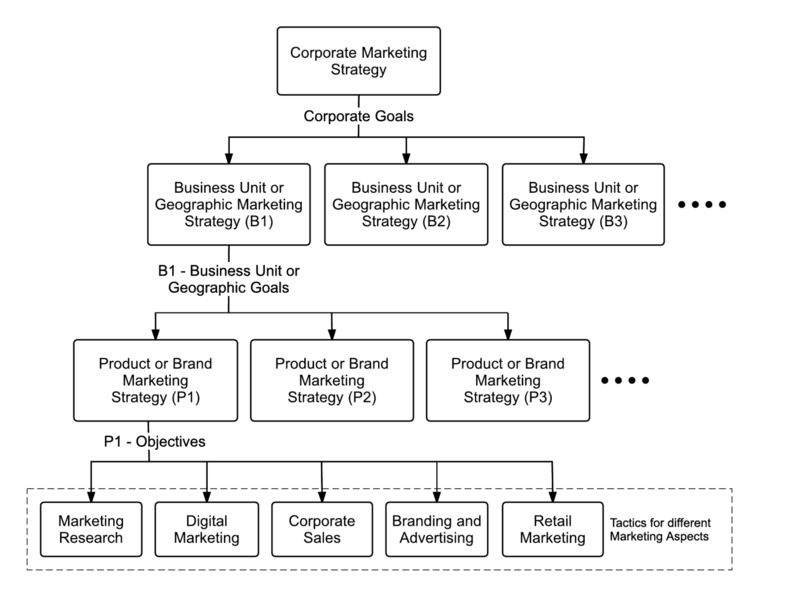 Beneath the wide umbrella of Corporate Strategy exists a smaller umbrella known as Corporate Marketing Strategy, which covers Business Unit and Geographic Strategies. Those, in turn, are further divided into particular Product or Brand Strategies for each product or brand. The Corporate Marketing Strategy is defined at a corporate level and outlines the overall marketing goals for the company. 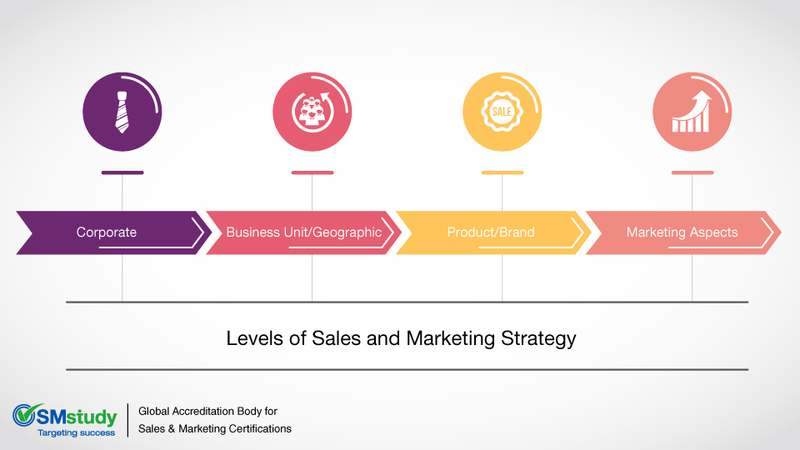 These general marketing goals drive more specific marketing strategies for each of the company’s business units or geographies. Each business unit or geography defines its own goals, which become relevant inputs for each area’s particular product or brand marketing strategies. Each product or brand marketing strategy defines sales and marketing objectives for each product or brand, which drive specific tactics that align with and often rely on other Marketing Aspects identified in theSMstudy® Guide (Marketing Research, Digital Marketing, Corporate Sales, Branding and Advertising and Retail Marketing). Corporate Level—A land development company wants to grow to be among the top three land development companies in its state. Business Unit/Geographic Level—The land development company operates two business units: residential and retail. A goal of the residential business unit is to grow that unit by 12 percent within one year; a goal of the retail business unit is to grow that unit by 10 percent within the same time period. Product/Brand Level—Within the residential business unit, the company sells three products: condominiums, town homes and singles. The singles Product Marketing Strategy identifies an objective to grow the sale of single units by 15 percent. To achieve this objective, the teams responsible for building strategy within the various Aspects of Marketing establish specific objectives that are designed to support the overall product objectives and to align with one another. Marketing Aspect Level­—The company’s greatest strength is the fact that it is an award-winning leader in green sustainable development. Therefore, the branding and advertising team builds specific tactics that incorporate an increase in reach of its messaging around sustainable development. One specific tactic is to leverage billboard and newspaper advertising with the objective of increasing reach of green messaging by 30 percent. The digital marketing team incorporates tactics to support the objective of increasing the green sustainable development messaging, stressing the importance of this trend and positioning the company as a leader in the industry through the use of various social media channels. One specific tactic is to leverage blogs and online public relations with the objective of increasing the company’s rankings in online searches related to keywords such as “sustainable development.” The tactics of each Marketing Aspect are aimed at achieving their own specific objectives; however, both support the overall singles Product Strategy objective of achieving a 15 percent growth in sales for this product line. When seeking sustained success, a company should equip and adhere to a comprehensive Corporate Marketing Strategy. That umbrella has you covered.